This entry was posted in Video and tagged ad, advertisement, SCTE-35. Bookmark the permalink. Is this information accessible to end user ? Typically only the latest versions are available from the web site and since the revision year is embedded in the file name, links to specific documents can go stale. I recommend that you also download SCTE 67 which is guidelines for the use of SCTE 35. This was recently revised to add sections on the use of SCTE 35 with DASH, HLS etc. Thank you for this very useful post, it clarifies a lot the spec. However one points remains totally unclear for me: the correlation between the splice_events and the segments. I understand how a splice_insert command inserts a splice_event and how a set of time_signal commands specifies a segment. But what is the correlation between a the splice_events and the segments? I guess that each segment is delimited by two splice_events but I cannot figure out how this is achieved because, according to the spec, the splice_events and segments seems totally uncorrelated. 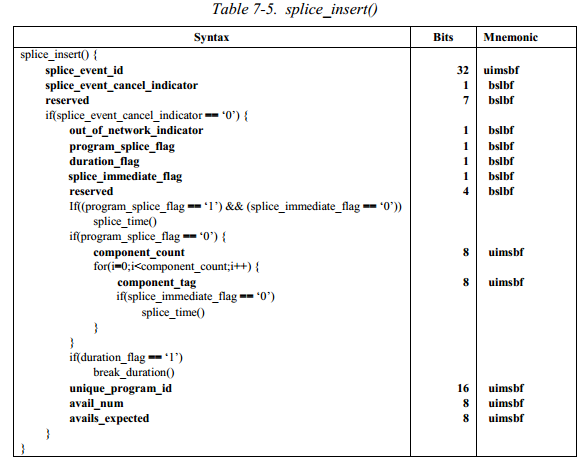 For instance, how is the beginning of a chapter linked to a splice_event defined by a splice_insert command since time_signal does not contain a field “splice_event_id” to do the connection? What is the difference between a segment defined by a splice_insert command and one defined by a time_signal command? Finally what is the purpose of this bloody time_signal command? Why not using splice_insert instead? 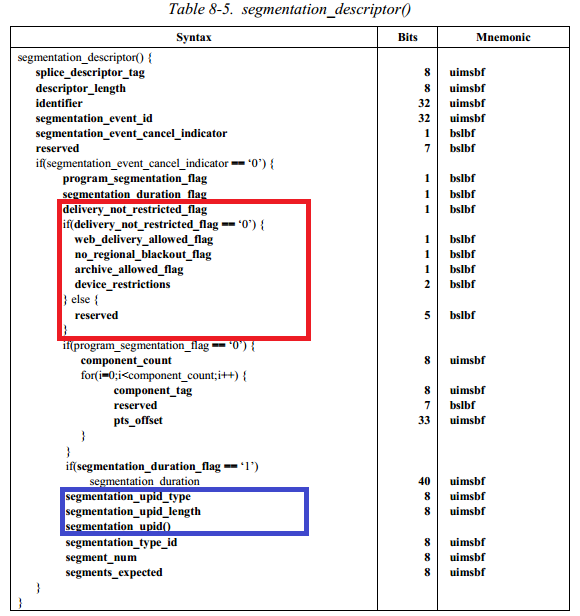 You can carry segmentation descriptors in either splice_insert or time_signal commands. They have the same meaning. 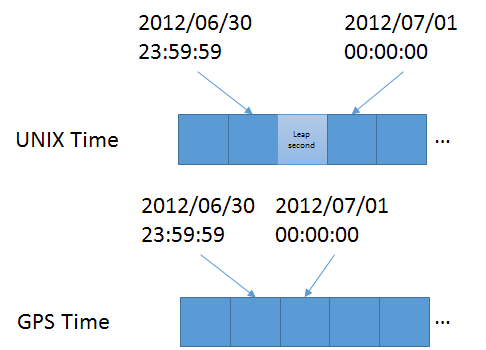 Time_signal allows you to link an event (e.g. chapter start) to the media timeline without necessarily commanding a splicer to insert or replace an ad (some splicer implementations are that dumb). Consider a program start for example. Many networks like to run programs back to back, so a program start is not a valid ad insert point, but being able to signal program start is very useful for network PVR, so you would carry that descriptor in a time_signal command. Would you know where I can find recordings of video streams containing SCTE-35 messages? I am researching on this project and can someone please share with me a sample TS stream containing SCTE-35 cue .My email is amit.shivnani@gmail.com . If you have received the requested streamCan you please share at neerajsachdeva91@gmail.com.I am also looking for the same. 1. SCTE35 inserted mpeg2 ts content, will appreciate if someone can post with a link for sample content. This will help perform compliance test on my code. 2. Also are there any SCTE35 supported player/analysers which show messages with timestamp available freely?. If you got any streams with scte35 info (splice_insert and time_signal) please share with me. I am also studying STCE35 system. If you got any streams with scte35 info (splice_insert and time_signal) please share with me, too. My mail address is yamamoto436@oki.com. I have some basic doubts. please clarify.The basic doubts that i have are 1)Is the video & audio of ad are added to video & audio of the actual program? 2)then howz it called dynamic ad insertion? 3) the ad will also share the same video & audio resolutions as the program’s video & audio? No Ad is not added to actual content.Yes Ad will be of same resolution as of base content. can someone please tell me whether the ad can be cancelled only if the splice_event is future event or it can be current running event(ie the current event has started and it is for 15sec & in between can the splice_insert with same event_id & cancel_indicator=1 can be sent).? Which player/decryptor do you recommend for SCTE marks verification? Does any player (vlc, mp) suport SCTE and allow to check SCTE events? Simple and clear explanation. Thanks a lot. I was just doing some research on ad insertion and splicing. I was just thinking if a national ad will be replaced with a regional or local ad, what happens if the ads duration are not the same.